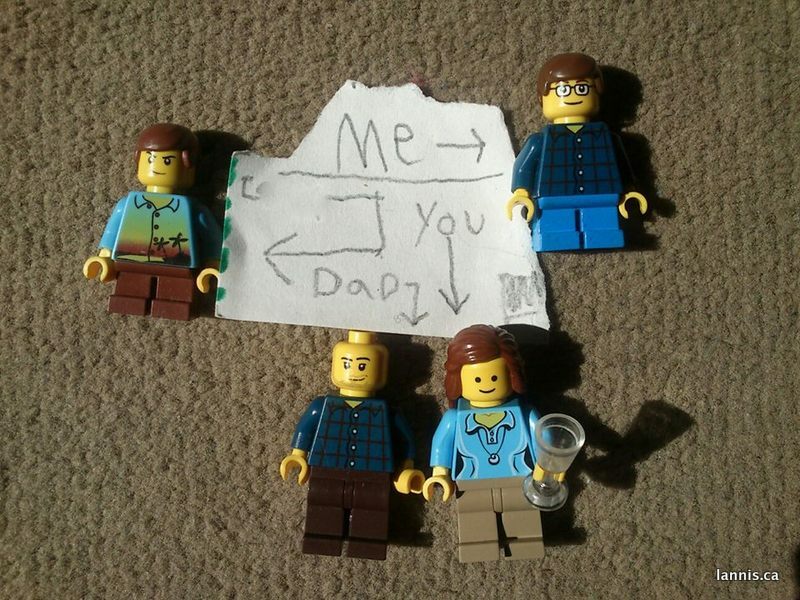 A few days ago I had a surprise... my seven-and-a-half year-old rendered his family in Lego minifigures. Not sure what I enjoy more... that he's depicted his little brother with a jerky expression, that Mr Lannis is bald with scruff, or that I'm holding a wineglass... Ha! R [7.5 y/o]: Aw, yeah, that was awesome! Mom flew out! L [6 y/o]: Yeah, she's dead. R: No, she isn't... [pause] Okay... maybe a little. That's great! Small one always pegs the other child (her being an only) as her Granddad. I apparently have a 91 year old child too. My 6-yr old removes 4 Cheerios from her bowl every morning. A mom, a dad, a sister, and a little sister. (Sometimes there's a third sibling, but we are not to talk about that one) Not to be confused with real life... these are just Cheerios, or so I'm told. At the end of breakfast they all meet an unfortunate demise.